Welcome to the website for the journal, Ask: Research and Methods. ASK is published by the Institute of Philosophy and Sociology of the Polish Academy of Sciences and archived at The Ohio State University. This publishing and archiving agreement was made possible by the organizational support of Cross-national Studies: Interdisciplinary Research and Training Program (CONSIRT.osu.edu) of The Ohio State University and the Polish Academy of Sciences. ASK is open access. All digital issues of ASK (ISSN 2544-0799), from the first in 1995 to the most recent, is available in The Ohio State University’s Knowledge Bank. 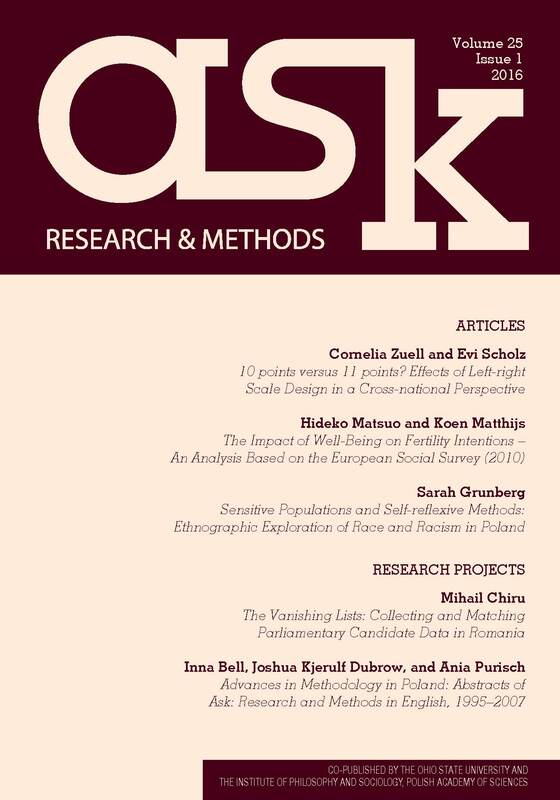 ASK is an English-language journal that publishes articles on social science methodology. On this website you can find information on what the journal is about, its Editorial Board, manuscript submission policy, indexing and abstracting and contact information.